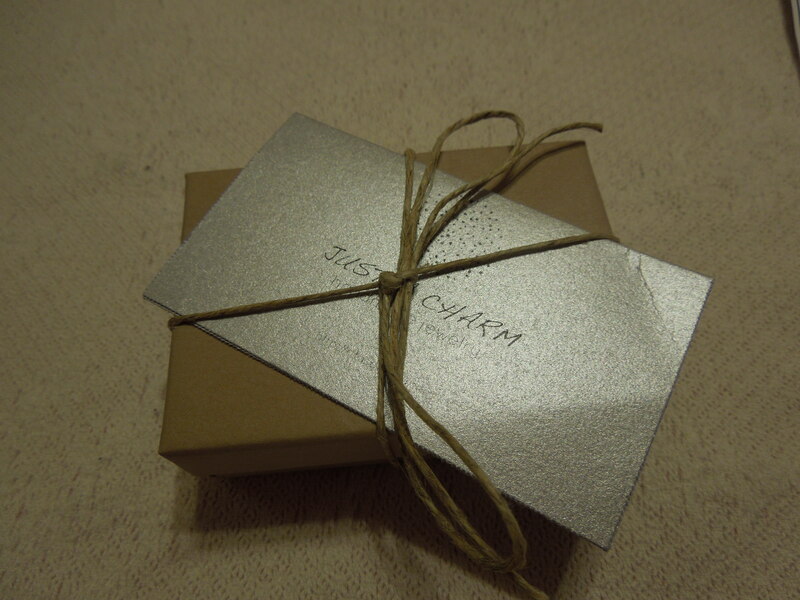 Got my first package for September from Fair Ivy, a subscription service that features handmade items. Skip down for more details on subscription options along with a coupon code. Now onto the review!!! 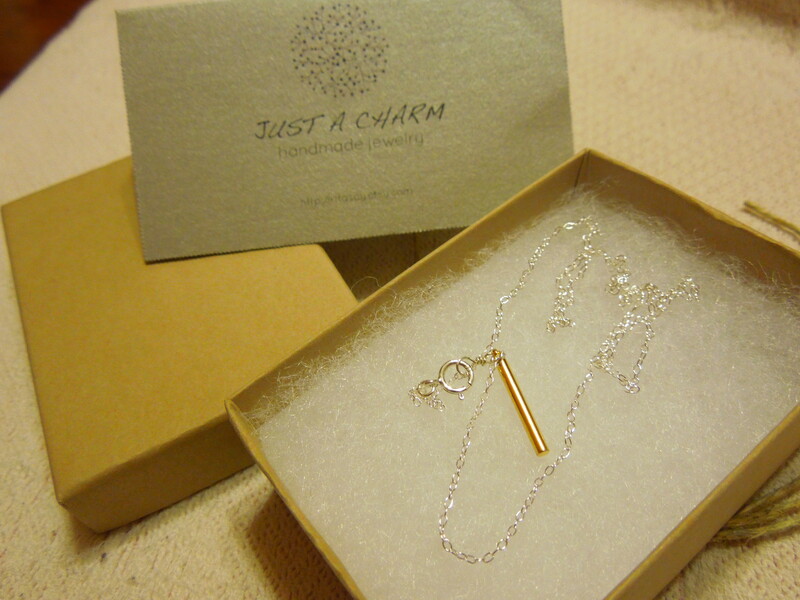 This month’s first package featured a jewelry selection from Just A Charm jewelry. They describe their pieces as “contemporary jewelry with clear and simple geometries. Each piece is handcrafted in New York City with sterling silver, gold filled, semi-precious gemstones and delicate charms. The style is modern versatile, minimalist and understated.” As is par for the course with Fair Ivy, the packaging was lovely and inviting. Inside was a sterling silver necklace. 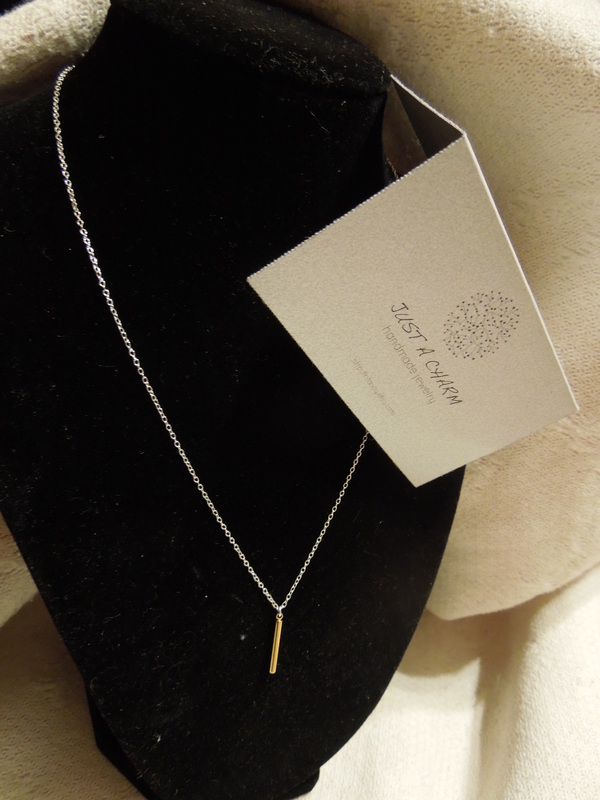 It features a 14K gold-plated bar charm. This is a simple, understated piece that goes with everything. I really find mixed metals to be interesting and I like the combination of sterling silver and gold plate. I couldn’t find this piece in Just A Charm’s Etsy store but a similar one in all sterling silver was priced at $23.00. As usual, Fair Ivy delivers sophisticated, timelessly appealing jewelry. Of all the boxes I receive I think this one ranks the highest in the category of gift giving. What necklace is gorgeous! Fair Ivy sounds like a fun subscription box. It’s a really great subscription and I feel good that it supports individual artists. Reblogged this on Some of my handmade designs. good day, just discovered your incredible blog thru Google, and located that is actually honestly informative, Warm regards and enjoy a wonderful day. Thanks so much! I try to pack as much honest information as I can into each review. I’m so happy you enjoyed it.